Disaster Response Ministries – Our mission reflects that of UMCOR’s Early Response Team program and is to Provide a Caring Christian Presence in the Aftermath of Disaster. When disaster strikes, United Methodists respond – with love, with prayers, with time, with labor, with supplies, with funds. 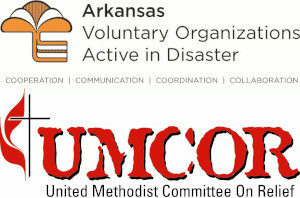 The Arkansas Conference of the United Methodist Church supports the efforts of individuals, families, congregations, and communities to prepare for and respond to disasters near and far. Through disaster response ministries, we work with the support of United Methodist Committee on Relief (UMCOR) and United Methodist Volunteers in Mission (UMVIM) in the areas of preparedness and early response and to support long-term recovery efforts. We communicate, cooperate, coordinate, and collaborate our efforts with other volunteer and faith-based organizations as well as government agencies. Partner relationships with those organizations and agencies are developed through our membership in the Arkansas Voluntary Organizations Active in Disaster (VOAD). Through VOAD partnerships relief is provided, immediate disaster caused needs are met, long-term unmet needs are addressed and duplication of services is minimized. The Conference Disaster Response Coordination Team, under the direction of the Bishop and Cabinet and as part of Connectional Ministries and the Conference Board of Global Ministries, oversees this Ministry. The Conference Disaster Response Coordinator serves as team lead. District Coordinators serve as voting members and represent each of the five districts in the Arkansas Conference. Other members fill specific roles and/or serve in advisory capacities. Some are members of the conference staff. See District Contacts for a listing of committee members. District and Conference Disaster Response Teams serve as disaster operations teams for the Arkansas United Methodist Church. We provide consult, resources and connection for communities affected by disaster and for local churches serving those communities as well as to those individuals wanting to offer assistance.